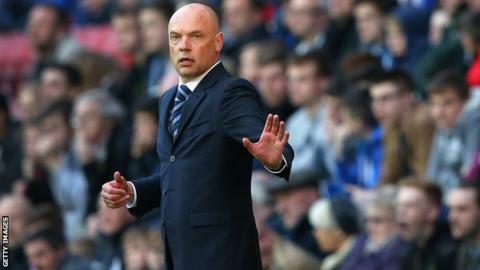 Wigan manager Uwe Rosler has backed his side to be "winners" next season after they lost to QPR in their Championship play-off semi-final on Monday. The Latics surged into the top six after Rosler was appointed in December. But hopes of an immediate return to the Premier League were ended by a 2-1 defeat after extra-time at Loftus Road. "I'm a strong believer that first you have to fail before you become a winner. Next year, we will be winners," Rosler told BBC Radio Manchester. After Friday's first leg had ended goalless, Wigan took an early lead in the second game through James Perch but Charlie Austin's penalty forced the tie into extra time. And the former Burnley striker netted the winner that sent Harry Redknapp's side to Wembley, where they will face Derby County on 24 May. "The players gave me every little drop," continued Rosler, 45. "They squeezed out everything they had. Uwe Rosler took charge of Wigan in December with the Latics 14th in the Championship table. In 37 games under the German, Wigan have won 19, drawn nine and lost nine. "Both teams gave it their all and I wish Harry all the best. He was very relieved afterwards." Wigan played a total of 62 matches in 2013-14 because of their involvement in the Community Shield and the group stage of the Europa League earlier in the campaign, as well as their run to the last four of the FA Cup later in the season. Rosler, who replaced Owen Coyle as Wigan boss, said: "I congratulate every player for the fact that they gave me everything. That is a fantastic feeling as a manager, when you have a group of players who dig in every single day. "They've had to play catch up for four or five months and with not a lot of room for error. "In the end, the tank got more empty and we found it harder to keep on winning, but we were very close."